Ian Webber, 54, was convicted of assaulting the boy after he "lost his rag" when he told the boy not to pull post-it notes from a display. District Judge David Robinson said the incident will already have a "huge impact" on his future. Judge Robinson discarded the submission of Webber's barrister Alexander Barbour that witnesses had engaged in "Chinese whispers" about the incident. 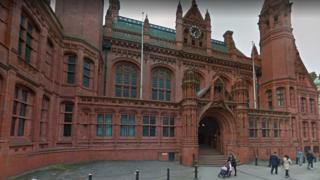 Sentencing him, the judge said: "I take into account that you were dealing with a difficult situation - but you were the adult, he was the child. "I also take into account that there are mitigating circumstances in this case. You only got involved to try and help. "You were doing the right thing, until you did the wrong thing." Judge Robinson said it was an "isolated incident in a long teaching career". Mr Barbour told the court Webber's colleagues described him as having an "incredible rapport with his pupils". He added he was likely to face a "summary dismissal for gross misconduct" following his conviction.